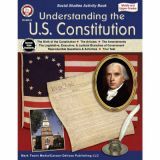 This book provides an in-depth look at our nations history and the importance of the U.S. Constitution. This book describes fascinating facts and fun activities your students will love! 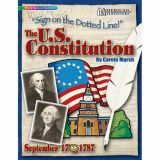 The American Milestone series are a favorite among teachers nationwide! This book includes ideas for lesson plans, hands-on activities, biographies, fascinating facts and stories. 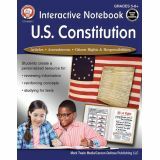 Your students will be amazed as they study the U.S. Constitution, one of the most influential legal documents in existence. Since its creation some two hundred years ago, over one hundred countries around the world have used it as a model for their own. 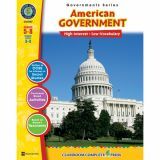 The American Milestone series meets national and social studies standards. This 28-page comprehensive book is reproducible and educational. Students read, observe, and analyze primary and secondary sources to answer document-based questions (DBQ) that range from identifying cause and effect, predicting possible outcomes, explaining point-of-view, summarizing main ideas, defining vocabulary from textual clues, and much more! 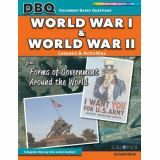 DBQs (Document-Based Questions) integrate literacy, standards-based content, and critical-thinking. Literacy DBQs students read, analyze, and write. Rigorous DBQs challenge students to use critical-thinking, reasoning, and problem-solving skills. DBQs connect reading and analysis to purposeful writing supported by evidence. The U.S. 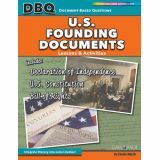 Founding Documents: The Declaration of Independence, U.S. Constitution, and Bill of Rights has higher-order thinking questioning techniques to help students build inquiry skills! Students learn to support their conclusions with evidenceóan essential 21st Century skill. Add critical thinking and rigor to your classroom! 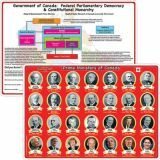 Using ready-to-use information and activities for remedial students, this resource presents a clear understanding between the three branches of the Federal Government, how the system of checks and balances works, how a bill becomes a law, how the electoral process works, and more. Includes reading passages, student activities, a crossword, word search, and comprehension quiz. 60 pages, 6 mini posters. Reading Levels 3-4. Cool rap songs with fun facts about each president through Barack Obama. 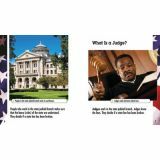 Also covers important information about the United States Government including the executive, legislative and judicial branches. 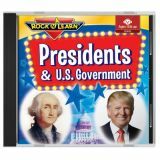 Includes lyrics book with suggested activities. Approx. 37 minutes. Ages 10 & up. 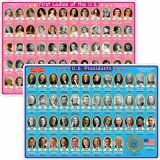 Two-sided cards feature official White House portraits on fronts, facts on back. 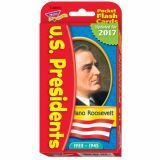 Includes 44 president cards, 3-1⁄8" x 5-1⁄4" each; era cards; political party history; and activity cards. 56 cards.